In an era of immediate gratification, we can sometimes lose sight of the enjoyment obtained from making something unique with our own hands. The time invested can provide years to a lifetime of enjoyment in knowing that you had a hand in the design of a special treasure. Such is the case when you visit the original Beadniks store on Church Street in Vineyard Haven. Beadniks, a bead emporium that encourages creativity, is the brainchild of founder Sally Roelser and harkens to a time when beads carried immense value. 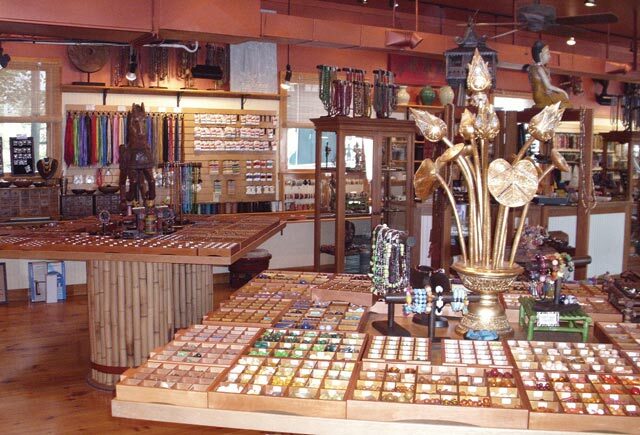 Here you will find a plethora of beads and jewels, ranging from simple to ornate, rare and original. Accompanying the hand-picked specialty beads found in such faraway places as Java, Nepal, and Bali, or close to home selections that include wampum, you will find all the tools and accessories needed to work with beads. If you have never attempted to bead before, fret not, as the staff is well trained in the art of beading and is on hand to help or even organize a group for learning the art. Classes are also offered; just call in advance to learn when the next one is: 508-693-7650. With the busy September wedding season arriving next month, it is not too late to host your own bridal party event right at the store or at a location of your choice. What a great way to provide your bridal party with jewelry for the trip down the aisle. You may pick out in advance the beads to be used for earrings, bracelets, and necklaces, or you can let your bridal party wander the store to pick their favorites. Whatever you choose, it will be a memory to cherish for all times, with a gleaming reminder in the colorful art made that day. For more information on hosting your own party, call them directly at the store. Keep in mind this is also a great idea for a birthday party for every girl ages eight and up, or if you are in the mood for a girl’s night out, maybe you can bond while beading. Another reason to head in now to Beadniks is in preparation for the coming holiday season. Rather than going out and trying to find the perfect piece of jewelry for a special gift, why not make your own? Here you can account for people’s favorite colors, favorite metals, personality, and style, all in one gift. The meaning will be clear and even more appreciated with the knowledge that you not only picked each bead, but also created something, even something as simple as a wine glass charm. With the holiday season come parties, and who hasn’t lost a wine glass or, worse, drunk from the wrong one? Why not make your own original glass charms to ensure you’re drinking from the right glass? If you are the hostess, you could offer to have your guests take them home as a gift. Another option for that fun-loving group you surround yourself with is to pre-select some beads with separate tags to leave out for your guests to make their own. Beadniks is open seven days a week from 10 am to 6 pm. 508-693-7650; beadniks.com.